Oscar Wilde is one of the most iconic figures from late Victorian society. Enjoying a meteoric rise to the top of society, his wit, humour and intelligence shine through his plays and writings. However, due to his sexuality, he suffered the indignity and shame of imprisonment. For a long time, his name was synonymous with scandal and intrigue. However, with changing social attitudes, he is remembered with greater affection for his biting social criticism, wit and linguistic skills. Oscar Wilde was born on 16 October 1854 in Dublin, Ireland. His parents were well known and attracted a degree of gossip for their extravagant lifestyles. In 1864, his father Wille Wilde was knighted for his services to medicine. Oscar Wilde proved to be a student of great talent. He was awarded a scholarship to Trinity College Dublin. Here he studied the classics, in particular developing an interest in the Greek philosophers and the Hellenistic view of life. From Trinity College, he won a scholarship to Magdalen College, Oxford University. He enjoyed his time in Oxford and was able to develop his poetic sensibilities and love of literature. He also became more conscious of his bisexual nature. For his increasingly “feminine” style dress he often received stick from more “traditional” Oxford students. He was a brilliant scholar, but also increasingly rebellious. In one academic year, he got rusticated for turning up to College three weeks after the start of term. Thus, after a while, he lost interest in pursuing an academic career in Oxford and moved to London. It was in London that he was able to skillfully enter into high society, soon becoming well known as a playwright and noted wit. Oscar Wilde became famous throughout London society. He was one of the early “celebrities” – in some respects, he was famous for being famous. His dress was a target for satire in the cartoons, but Wilde didn’t seem to mind. In fact, he learnt the art of self-publicity and seemed to revel in it, at least up until his trial in 1898. 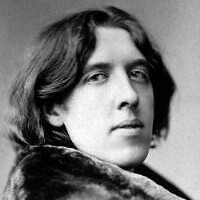 Shortly, after the case ended, a warrant was issued for Wilde’s arrest under Section 11 of the Criminal Law Amendment Act 1885 – which outlawed homosexuality – even between consenting adults. Oscar Wilde’s trial gripped the nation, the subject matter a source of intense gossip and speculation in the press. The trial moved to a quick conclusion and Wilde was found guilty. For his “crime” of homosexual acts, Wilde was given the maximum jail sentence of two years hard labour in Wandsworth and then Reading Gaol. It is no understatement to say this experience deeply shocked and affected the previously ebullient Wilde. In some respects he never really recovered; on his release, he left for Paris where he lived in comparative anonymity. However, he retained his wit and continued to write, heavily influenced by his chastening experiences. Of these post gaol writings, his poem “Ballad of Reading Gaol” is perhaps the most well known, illustrating a new dimension to Wilde’s writing. Although Wilde couldn’t return to his previous level of writing he developed new capacities, whilst retaining his sharp intellect. As Jonathon Fryer commented on Oscar Wilde’s final part of life he was. The Life of Wilde was turbulent and volatile – never short of incident. It reflected his own inner paradoxes and revolutionary views. In some ways, he was both a saint and sinner at the same time. Rightly or wrongly Wilde is remembered as much for his life as his writings. However he himself said. His writings reflect in part his paradoxical view of life, suggesting things were not always as they appeared. As his biographer, Richard Ellman said of Wilde. Whatever one may make of Wilde’s life, his capacity for writing remains undeniable. His greatest work and comedy is arguably “The Importance of Being Earnest”. Here the plot line is thin, to say the least, but Wilde brings it alive through his scintillating repertoire of wit and biting humour. Wilde was not an overtly political commentator, but through his plays, there is an underlying critique of social norms that are illumined for their absurdities.